I make a lot of oven-fries and potato salad. I've also made some perogies. I've even made mashed potatoes and then used all the leftovers to make some delightful little garlic mashed potato logs (with cream cheese!!). 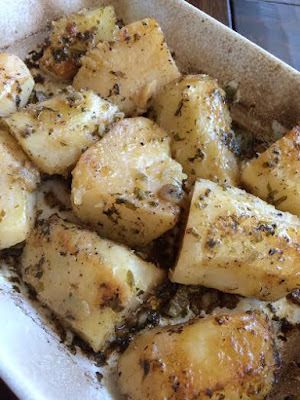 So, last week I decided to try and make some roast potatoes with Greek flavors. These were inspired by our favorite Greek restaurant here in Calgary. They were definitely different than those served there, but they were still delicious! These are great for kind of a dreary day, as they cook low and slow in the oven. Place potatoes in a shallow baking dish (I used a 9x12 glass baking pan). In a small bowl, whisk together all other ingredients. Pour evenly over potatoes and lightly toss around so they are coated. Cover tightly with foil and bake for 2 hours at 300F. After 2 hours, uncover and spritz with the juice of half a lemon and turn potatoes. Cover again and continue baking for about 30 minutes. Remove from oven and let them rest for about 10 minutes after removing from the oven, to let all the browned garlicky goodness caramelize up a bit. Enjoy!